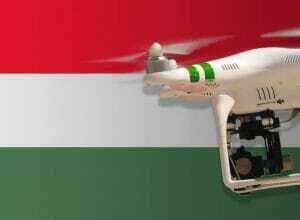 In this post, we have summarized for you the current laws for the use of drones in Hungary. At the moment it is quite time-consuming to obtain permission for a drone flight in Hungary. The Hungarian government has been working for some time according to new laws. Hopefully, the new law will simplify the situation in the future. At the moment you have to adhere to the following rules. First, you need a Temporary Designated Airspace (or Eseti légtér engedély) from the Military Aviation Authority to use a drone. Since there is currently no English language version of the application documents, you should contact the authority directly (klh@hm.gov.hu or by phone + 36/1 / 474-12-74). The application must be requested at least 30 days before the intended flight date. If you have been granted temporary air clearance, you will not need to obtain additional permits as a hobby pilot. However, you must carry proof of drone insurance valid in Hungary with you. If you plan to use your drone in Hungary commercially, you must inform the Hungarian Aviation Authority about the scheduled drone flight. For this, the authority will provide this form, which you can fill out and send to rpas@nfm.gov.hu. When you leave Hungary by plane, there is a special feature to consider: in Hungary, you can not take your copter into your luggage. On departure from Hungary, you have to transport your copter with your checked baggage. We have researched the listed drone regulations for Hungary to the best of our knowledge. We can not guarantee the correctness of the information. If you want to be on the safe side, please contact the competent aviation authority. Alternatively, you can also ask the embassy in your country for further information about the regulations. Please leave us a comment when you receive news and/or gain experience with your copter in Hungary! Drone is not allowed in you hand baggage! Hello, i can confirm now i just passed the security check and i argue like no tomorrow but i had to check-in. mine is a Simple Mavic Pro. be carefull because i found only on this site this information. on the airport there are no advice before the security check. This is the most stupid rule on the world. Basically you cannot bring drone at the gate. Depending on the exact place where you would like to use the drone, you need to have an official permit (http://legter.hu/en/). You always have to check the map for what kind of permit you need for using your drone (http://terkep.legter.hu/). Any updates on the Hungarian rules? I am traveling there in late Jan and the only information I can find is about “drones not being allowed in your hand language”. Firstly – what an awesome site, a fantastic resource and I hope you can help with my question. My 16 year old son will be travelling to Romania with a school group to take part in a charity project (building houses). He is flying from Ireland and lands in Budapest and then travels overland to the site in Romania. I was hoping to lend him a DJI Spark and a GoPro to document the build. He’s a smart kid and could be trusted not to fly in restricted, prohibited or dangerous areas etc, plus there will be adult supervision at all times. My worry is that he is not a seasoned traveler and even small problems at customs could potentially tarnish the trip. I can take the risk of the losing the drone but would hate to jeopardize his enjoyment. Supposing he traveled with the drone in his checked luggage – do you think he would be okay or would he require documentation etc. Any thoughts would be great – and well done on a really useful site. Derek, not sure if your son’s trip has taken place or not. As a frequent traveler to Romania through the Budapest airport, as recent as last month (May), I can say that if you put the Spark in his checked luggage, he’ll be fine (he can keep the GoPro in his carry-on. No documentation needed at all, either at the Hungarian Customs desk, the Romanian border when he crosses over, or back at the Hungary border coming back towards Budapest. The only issue is taking the drone in your carry-on bags through the Hungary airports – not allowed. But in checked luggage, no problem. As an aside, I do think permission/documentation is required if he wants to fly it IN Hungary, but if he’s just carrying it while in Hungary, he’ll be fine if he checks it in his luggage. Hope he enjoys Romania – beautiful country, wonderful people (I’m transitioning to go live there myself, from the USA 😉 ). If a drone is flying above my land, filming my family and my animals, and it is close enough that I can shoot it with an air pistol, am I acting illegally if I shoot it down? Guys! Also worth mentioning that since hungary is turning into a totalitarian police state, they can take your drone with the “You dont have a license to fly drones” arguement. Its worth noting that beside Aerospace usage you need a “drones license” but it doesnt exist officialy in hungary yet. This problem with drones is not easy to understand for me either, but I can tell you one thing. I was travelling out to Amsterdam/Oslo/London/Narvik etc from Budapest, and only in Budapest Airport they found my small piece of steel in my shoes, asked me to open my luggage to have a look inside for the crazy number of cable and winchesters I have in the luggage. In Budapest airport they have better detection and much more strickter rules then in many other int. airport. That it is. You comment of “totalitarian police state” was offending me and many fellow Hungarian. B#*$*”d! I’m going to Budapest tomorrow and now I see this! Was really hoping on getting some epic drone shots and since I’m only taking carry on well that’s that out the window, I don’t understand why your allowed to carry a drone into Budapest with carry on and no hassle ( like your supposed to with batterys etc) but when you travel back to your own country this is not permitted!? That really is the stupidest thing I’ve ever heard. I am going to Budapest in a couple weeks and then on to Sweden after. I have no intention of flying while in Budapest / Hungary, but would like to take the drone along with me to Sweden after so will have to carry with me through Hungary. Sounds like as long as I check it when going in / out of Hungary, I would be fine and don’t need anything else like proof of insurance / license / etc., but want to make sure before I take it with me Anyone have an update and know if this is still OK? I flew into budapest with my drone checked baggage no problem. On way home they force me check my small bag and would not let me bring on the plane. I dont understand the reasoning bit their country their rules. Cost me 25 euro ughh. Yep, and you have to apply for airspace clearance at least 30 days before, preferably even earlier, BUT not earlier than 60 days, because then they’ll just reject your application because it’s “unforeseeable”. Oh, and one application costs almost 10 EUR (even if it’s rejected).